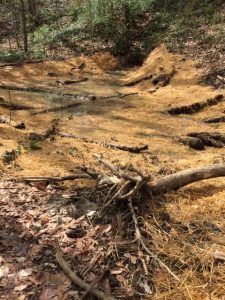 Follow the link to see an exciting video about the Wetlands at UNCG! 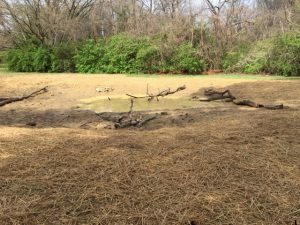 The RISE Network began discussions of campus wetlands in October 2014 and facilitated a wetlands exploratory committee in the summer of 2015 to discuss constructing wetlands on the UNCG campus. 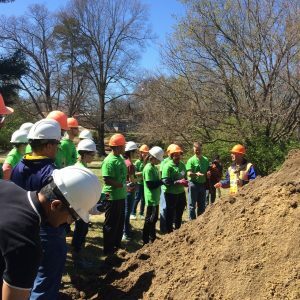 Members include faculty, members of the Peabody Park Committee, Sustainability, URESCO, UNCG students, the City of Greensboro, and UNCG Facilities and Operations. Wetlands are beautiful and demonstrate UNCG’s commitment to environmental preservation and sustainability. Wetland ecology and water chemistry will be integrated into teaching and learning experiences in sciences and education. Environmental and nature studies will be integrated into many other departments, including Environmental Studies and English. As an outdoor living learning laboratory, the wetlands will be a resource for K-12 education and community. Improve water quality of runoff from athletic fields in the receiving tributary stream to North Buffalo Creek. Increase biotic diversity with native wetlands plants and the succession of microorganism and animal populations. Provide research opportunities for students and faculty across disciplines and colleges. Create a living laboratory for outreach in K-12 education projects, and community relation events. Enhance the beauty of our Campus landscape. In February 2016 the UNCG RISE Network invited an expert in wetlands construction and restoration, Tom Biebighauser for a three-day visit (http://www.wetlandrestorationandtraining.com/). 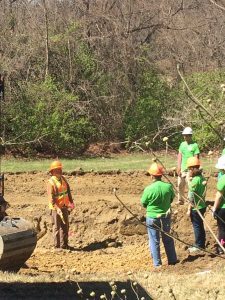 He has constructed > 1700 wetlands, many on college campuses with > 95% success rate for permanent, self sustaining wetlands (Biebighauser 2007, 2012, Eubanks and Biebighauser 2014). In Fall 2016, two sites in Peabody Park were identified: between the creek and the athletic fields, south of the golf course and a woodland site in the north of Peabody Park near Market Street. Installation of the Wetlands was in March 2017. Continue to check back for how you can be involved.